Driving on bumpy roads may not be quite so unpleasant anymore. A pair of former MIT students are working on a new shock system for vehicles that retains the energy generated when a car bounces up and down. The device, dubbed the GenShock, can yield significant gas savings and help power onboard electronics like air conditioners and radios. Former MIT students Zack Andersen and Shakeel Avadhany formed Levant Power a couple years ago and have been working on optimizing the GenShock ever since. As cars with traditional shock systems bounce up and down over pot holes and bumpy roads, the shocks minimize that movement by compressing air or liquids. That compression actually generates heat, resulting in a loss of energy for the vehicle. Instead of releasing heat, the GenShock uses that movement to turn a turbine. That turbine connects to a generator that feeds into the car’s battery, powering onboard electronics in standard cars and acting as a power source in hybrid vehicles. Not only can the device generate electricity, preventing heat loss saves gas. 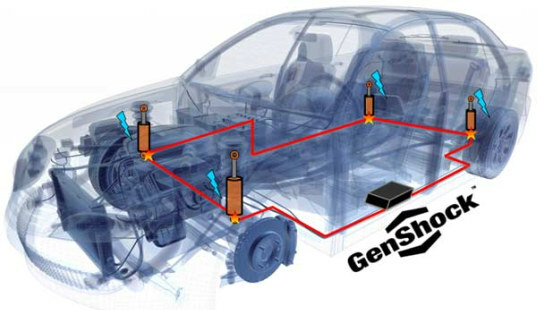 Developers say the GenShock results in a one-to-six percent gas savings for every car. That number may seem paltry, but let’s put it into perspective: In 2007, medium and heavy-sized trucks used 34 billion gallons of diesel fuel. If trucks used a GenShock that reduced each vehicle’s fuel use by one percent, it would save 3.4 million tons of carbon dioxide! The GenShock is still being developed, but designers say they hope to have the device market-ready in the next 18 months. In the meantime, Andersen and Avadhany say they’ve been talking with truck- and carmakers, transit operators and the military about implementing the GenShock in vehicles. how much ampere current can begenerated from this? doeesn't it create any current shock problem to the people?